Outsourcing industry is an ever growing sector and has revolutionized the way business is done in almost every sector. It was a gradual process that evolved with time and as per the latest requirement of the industry. The basis of outsourcing business is to fast-track the pace of one’s business and increases its productivity. Considering the dynamism of current era complex business operation, outsourcing is indeed a blessing for the business community as a whole. 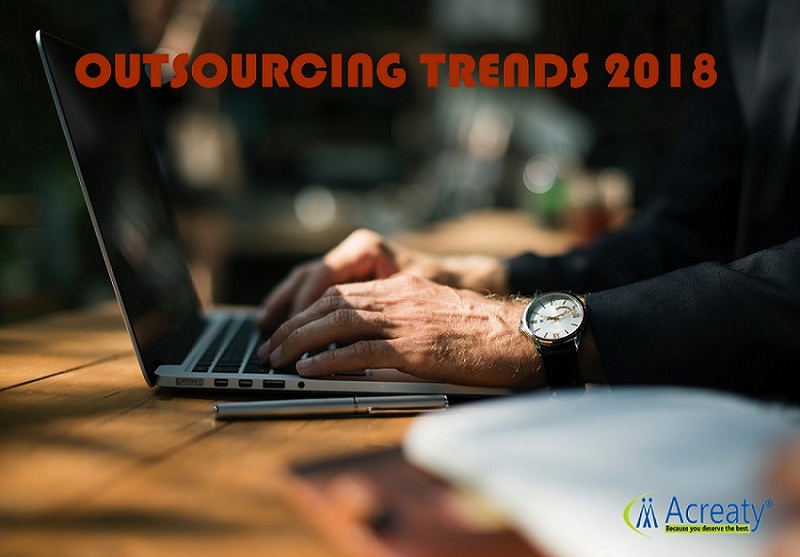 The year 2018 will see a further growth in outsourcing trends all around the Globe. Especially, the industries and businesses relating to technology, innovation, social responsibility and data security will see enormous growth in outsourcing. Latest survey reports have specified that 65% of companies that outsourced in the past will continue to do so this year. This only goes to show the reliability and faith that world-wide industrialists and entrepreneurs have in outsourcing. From artificial intelligence (AI) to security to cloud computing and the transformation of communication, let’s explore the forthcoming outsourcing trends for the year of 2018. · Cloud computing will reach its top-level- Cloud computing in 2018 has been forecast to reach 200-Billion USD very fast. Firms will now be able to increase their functional capabilities & process areas, while managing the requirements/ problems of clienteles with ease. Cloud computing will pave the way for tailored and cost-effective solutions. · Data security will gain more importance- This year will see prominence in cyber security. In 2018, clienteles will expect a high level of data security, as even a slight breach in security can bring in huge loss. Outsourcing service providers have to work towards offering encrypted & secure servers for communication. · RPA (Robotic process automation) will get famous- RPA will become more popular this year. Robotic process automation can ensure better efficiency and productivity at a low cost, while offering finest quality. For example, more call centers are choosing IVR over call center executives. On the other hand, AI (Artificial intelligence) will rule the world of technology and outsourcing, while helping clienteles make huge savings. · Improved proficiency and competence in outsourcing- With automated procedures, the latest software and best practices, the outsourcing industry in 2018 will offer higher competence and efficiency. · Security will get better with outsourcing- Outsourcing will make a way for corporations to stay safe from fancies and political whims. Outsourcing can provide a caution for companies by undertaking their accounting and administrative works. Through outsourcing, a company can decrease its overall operational and administrative cost. Experts have anticipated a wave of change in traditional communication. Companies in 2018 will take email promotion, social media marketing, web services & mobile marketing over traditional means of marketing. As per the recent outsourcing survey, global clients from diverse fields will go for outsourcing in order to access better services with value-add options. Clients will expect specialized and improved services from outsourcing service providers. The scene of outsourcing in 2018 seems to be bright indeed. Firms in 2018 will be able to improve their overall efficiency, improve flexibility, reduce their operational expenditures and augment productivity, all with the support of outsourcing.